Minister in the Natural Resources Ministry, Simona Broomes is confident budget 2017 will benefit the mining sector, but the Guyana Gold and Diamond Miners Association as well as the Guyana Women Miners Organisation feel differently. A number of groups have come out in opposition of the proposed 2017 budget including the private sector commission. 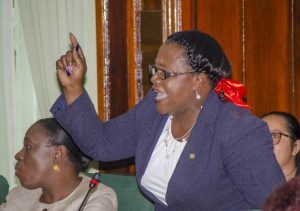 Broomes, a former head of the women miners group told the National Assembly on wednesday that the mining sector accounts for 12.1% of Guyana’s Gross Domestic Product (GDP). “The 2017 budget along with the previously proposed 3% reduction in the gold board price for gold and the removal of concessions to the sector, can only lead to lower declarations and a decline in the sector that would take the economy into a negative spiral. There will be no growth in 2017 without mining,” the two mining groups said in a joint statement. The mining groups further complained of the difficulty of attaining fuel concessions, which appear to be impossible when examining the 2017 budget. On the proposed Tributors Tax increase from 10% to 20%, the mining groups explained there is already difficulty explaining the 10% tax deduction from their salaries. “To ask for double is exposing operators to even more aggression. We do not welcome the burden of collecting tax for Guyana Revenue authority (GRA). We are asking the GRA to mount a public awareness campaign to ensure that workers understand that the increase is a GRA requirement,” the statement continued. Opposition MP Odinga Lumumba feels the mining groups should have been consulted on the budget. “I want to compliment the Minister for bringing the Guyana Geology and Mines staff, but you should have brought the miners who will have to pay the 20% tax,” Odinga told the House during his budget speech. On government’s drive to build the Linden to Lethem Road, Lumumba questioned the David Granger administration on possible commitments from the Brazilian Government since Brazil would also benefit from the development of that road.